Some comets are meant to be discovered. They are bright and easy to see. They hang in the sky for months at a time, and some even reach naked eye visibility. Some comets are nearly impossible to catch. They brighten as they enter the inner solar system, but travel through areas difficult for the comet hunter to reach. Some move quickly, some remain faint, some do both. This is the story about one of those comets. It not only had to be discovered but had to be found again before it could be verified. I first got interested in astronomy at the age of 8. From there I graduated to my first telescope, a 2” refractor, on my thirteenth birthday. I used that to view the moon, planets, and stars for the next three years. On Christmas, in my 16th year, I bought a 6” reflector telescope, getting much use out of that for many years. I still use it today for public star parties and found my tenth Comet with it. It was in late 1974, after learning the sky, doing some astrophotography, and getting out of the military after three years of service that I decided to take my hobby of astronomy to the next level. Of the options open to me I chose comet hunting. Very few amateur astronomers were searching for comets, I enjoyed the view of the night sky through the telescope and it cost nothing to start. So on January 1, 1975, I started a systematic search for comets. It was nearly 4 years and 1,700 search hours before I found my first comet, in September 1978 from Loma Prieta, CA, in the Santa Cruz Mountains. My second took 6 more years, I found that one in May 1985 from Big Bear, CA, on the last day of an astronomy conference. My next find came less than a year later, my first periodic comet, now known as P/96. It is one of the most unusual comets ever discovered, appears to be the brightest periodic comet on a regular basis, and returns every 5.2 years. In August 1988 I found my fourth comet. Like my second comet, it disintegrated as it neared the sun. 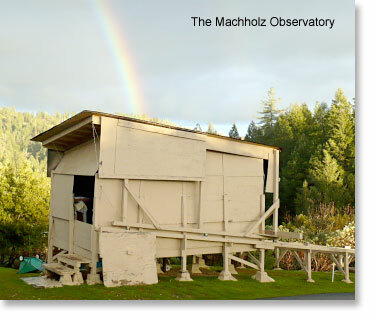 We then moved to Colfax, California, where I found two comets in 1992, three in 1994 and one in 2004. For the past 15 years, I’ve been doing about 100 hours of searching per year, most of it from my homemade observatory. So I got up at 4:15 on the morning of Tuesday, March 23, 2010, for comet hunting. Over the previous week, I had scanned, or swept, much of the eastern sky, mostly near the equator and south of it. Today I will cover an area in the northeastern sky. 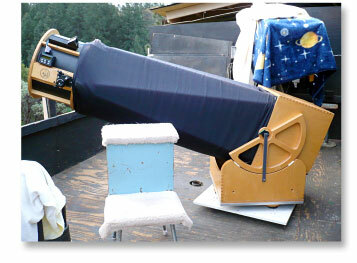 The telescope I used is an 18.5-inch (0.46m) reflector, f/4.8, with an eyepiece yielding 77 magnification and a field of view of 0.8 degrees. I bought it second-hand from a fellow amateur astronomer in May 2006. I’ve never been one to have “aperture fever”, the desire to have a larger and larger telescope. I have always believed that how faint one sees depends upon the eyes, skies, and telescope, and probably in that order. 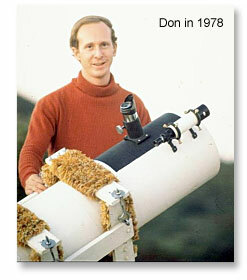 When I got my 10” reflector telescope in late 1975, I had one of the largest telescopes being used for comet hunting. Since then other comet hunters have gotten larger scopes, with 16” being typical since the late 1980s. I used the 10” faithfully for comet hunting until I got the 18” in 2006. 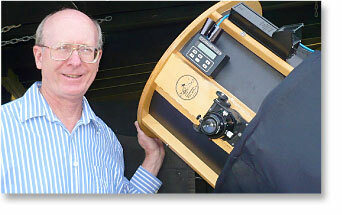 Along the way, in 1983, I built 6” binoculars, with which I discovered four comets. When I began using the 18” telescope for comet hunting I realized that I was picking up nebulous objects as faint as magnitude 13, or about five times fainter than I did with my 10” reflector. But there was a trade-off for this increase in-depth; my field of view was about 35% of what I had with the 10” scope. With a smaller field of view, it took me much longer to cover a given area of sky. This is one of the decisions that a comet hunter has to make, to cover a wide portion of the sky and not see very faint, or to cover a smaller area and see many faint objects. On March 23, after suiting up (the temperature outside was 42 degrees F), my yellow lab dog Roxy and I went out to the observatory to start another session of comet hunting. I began at 4:35 AM, covering a rectangular area between 45 and 30 degrees north declination. After each sweep, I returned to the starting point and did another sweep. Since the earth is rotating and the stars are rising in that part of the sky, I was now sweeping through new territory. To visually discover a comet, the comet hunter looks through the eyepiece of the telescope while slowly scanning (sweeping) across the sky. What he is looking for is a fuzzy patch of light. When a comet is discovered, it typically has no tail, and it moves very slowly, covering perhaps one degree (two moon widths) per day. In the course of this sweeping process, many fuzzy objects are picked up, but more than 99% of the time they are galaxies, clusters, nebulae, or small groups of faint stars. These are plotted on star atlases and in computer databases. 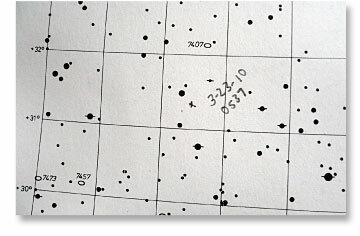 Occasionally a comet hunter will pick up a previously discovered comet; those are on printouts from Internet websites. I have such a printout with me when I’m searching for comets. I have also equipped my telescope with an electronic setting circle device; it determines where the telescope is pointed and provides a readout for me. It sorts through its database and tells me if a known galaxy or cluster is in the field of view. I picked up several objects during this sweep. All were galaxies: NGCs 7217, 7331 and 7426. After an hour of sweeping, I realized that I had about 15 more minutes before the approaching twilight would end my session. Two more checks needed to be made. First, I had to make sure it was not a known comet. I memorized the position that the setting circles were giving me (RA 22h 53m, +31.3 degrees) and checked against the coordinates of all known comets bright enough to be visible through my telescope. None were known to be in the area. This took a couple of minutes, so I had to find the object again. So now I was fairly certain that it was a comet, and that it was undiscovered. The second check is to see if it is moving. A comet should show motion against the background stars in a half-hour or so. I made a drawing on my log sheet, showing the stars and placing an “x” where the comet was. It was 11 minutes since I first saw the comet. In the background my radio was playing, Rob Arnie and Dawn were on, and Arnie was talking about exploding whales. It was humorous, but I had to keep to the task at hand. The sky was brightening, and the comet was becoming harder to see. I switched eyepieces to a higher power and made another drawing. I also plotted it in my atlas; this helped to confirm the coordinates of the object. Upon switching back to lower power, I found the comet was now disappearing into the background. I had not detected motion. I closed up the telescope and came back onto the house. A potential comet discovery is reported to the Smithsonian Astrophysical Observatory, actually, a portion of it known as the Central Bureau for Astronomical Telegrams (CBAT). They are the clearinghouse. They confirm the comet’s existence, if they can, and determine the orbit and place the name on the comet. They then release the announcement about the comet. However, in order to get follow-up observations, they prefer to have some motion detected so other observers down the line would know where to point their telescopes. Back at my desk, I turned on my computer and entered the world of the Internet. I checked the CBAT’s website (the “CMTChecker”) to see if any known comets were at the position of this object. None were. I then looked at another website and downloaded a photo, taken years ago, of the area. No faint galaxies or group of stars were in the area. So I had a decision to make: should I tell the CBAT about this comet, or wait until the next day and check it on the second night? I woke up my wife and told her what I had found, then decided the best choice would be to notify the CBAT today. I typed up an e-mail, explaining that I did not detect motion while giving the position, brightness (magnitude 11), and the date and time I saw it. I also said that the sky was supposed to be clear the next morning, so I should be able to get the second position then. Typically this would be no problem. I had a busy day, but it did not go by fast. As a real estate appraiser, I had research, analysis and two inspections to do. In the second half of the day, there were some high clouds coming in from the west. I did not sleep well that night, checking the weather several times before finally getting up at 3:50 AM, before the comet even rose over the horizon. I got out to the observatory, uncovered the telescope, and looked at some star clusters while waiting for the comet to rise. The weather was not good, with high cirrus clouds hiding some of the stars. As the area rose above the local horizon at 4:30, I put the telescope on it and watched. The stars were fading in and out due to the clouds. My clearest view was at about 5:15, and then the clouds thickened again. I did not see the comet but also saw nothing at the location that it was at the morning before. I came back into the house and notified the CBAT. I suggested that they put it on the Confirmation Page (for others to try to confirm), or notify other observers and get them to try it. They said they would do the latter. The weather forecast for Colfax was for rain the next morning. So after checking the weather forecasts for other parts of the US, I notified amateur astronomer Alan Hale, New Mexico, and asked him to confirm it. Alan is co-discoverer of Comet Hale-Bopp, has confirmed my comets in the past, and is fully capable of seeing this object. He said that he would give it a try. Wednesday was another long day. My car would not start and needed to have its battery replaced. Then I drove to Nevada County to walk 6 miles to inspect a 40-acre land-locked property. It rained in Colfax early the next morning. I received a phone call from Alan Hale. Did he see the comet? No, he did not, and he searched two to three degrees from the earlier location. The only reason he would have missed it is if was on top of a bright star. The CBAT indicated that no one had reported seeing it. I now had two more mornings with no moon in the sky in order to find this comet. The question was; where did it go? With moonset at 4:44 AM on Friday the 26th, I would have only about an hour of dark sky to search. The next morning I would have even less time. But I also have learned that some comets, in this part of the sky, are headed toward the sun. That would favor the area below the comet’s original position. So I mapped out an area to sweep, outlining a rectangle at least seven degrees from the comet’s original position. I had two short mornings to catch this comet, or it would probably be lost forever. My plan was to begin at 4:15 AM. That day I cleaned my telescope mirror and re-aligned the optics. It rained that day, and into the night, but the storm was fast-moving, and the sky was predicted to be clear by 3 AM. I got up just before 4 AM, and the sky was clear. I began sweeping at 4:20, and for the next 58 minutes I picked up only a galaxy, but no comet. Finally, at 5:19 I picked up a faint fuzzy object, my first and only thought was that this was the comet. There was no galaxy in that part of the sky, so I plotted it on my atlas and made a drawing to see for sure if it was moving in the proper direction. I went into the house and woke my wife and youngest son Mark, but Matt was too difficult to awaken. Mark came out and saw it, but my wife was unable to see it through the telescope. The comet had been moving two degrees per day, a fast rate for a comet. I came in and reported it to the CBAT. An hour later I talked to Dr. Marsden of the CBAT. He was thinking of holding off on the announcement until they had a preliminary orbit, and that would require getting more accurate positions from astronomers with electronic cameras. It was placed on the Near Earth Object (NEO) Confirmation page and observations came pouring in. As it turned out, the announcement was made later that day, Friday, March 26. The comet will remain faint, and more difficult to see as it nears the solar vicinity. 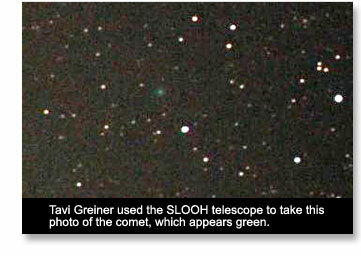 This was my 11th named comet discovery, coming 607 hours since my previous find in August 2004. I had swept for a total of 7,654.25 hours since January 1, 1975. This is the first visual comet discovery since October 2006. With the automated search programs finding objects much fainter than the visual comet hunter, it is expected that the number of visual comet discoveries will continue to decrease. As with each of my comet discoveries, it is both a blessing and a humbling experience to find one of these objects. This comet had to be found twice.